Pharmacy students in Uganda. Photo by Tommy Trenchard for IntraHealth International. Thousands of students now have 24/7 digital access to academic materials thanks to two new digital libraries. 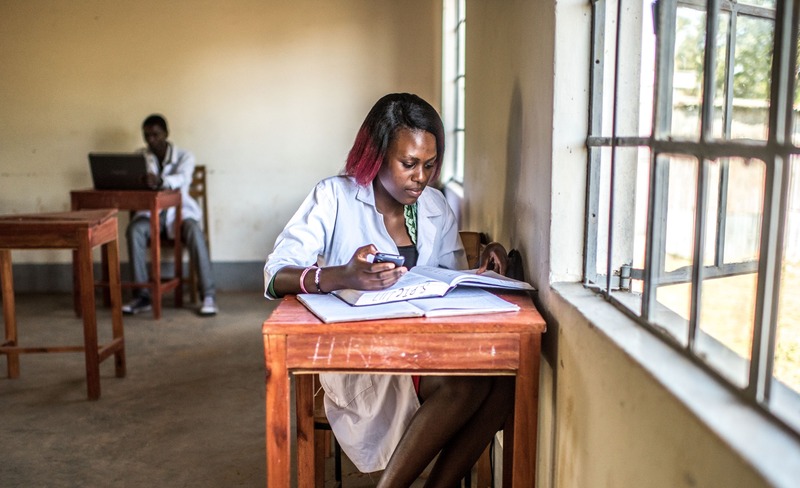 Until now, thousands of Uganda’s medical, nursing, health management, and allied health students had to share a small, cramped library with too few resources for the growing number of students. Many students were simply unable to check out the reference and academic materials needed to study effectively for their coursework and exams. Through its USAID-funded Strengthening Human Resources for Health Activity, IntraHealth International helped the Uganda Institute of Allied Health and Management Sciences of Mulago (UIAHMS) and Kabale University transform their small libraries from traditional hard-copy to digital collections. “Students used to go as far as Makerere University to access fairly good library services, which still were insufficient due to the high numbers of students,” says Alfred Otim, principal of UIAHMS. Now, over 3,000 students from Makerere University Medical School, UIAHMS, and Kabale University are using the new digital libraries—and the number of study materials students are accessing has tripled since the schools launched the new systems. Over 3,000 students are using the new digital libraries—and the number of materials they are accessing has tripled. “On a daily basis, between 150 and 200 books are downloaded,” said Juliet Bulyaaba, the e-library attendant at UIAHMS. Previously, fewer than 50 students per day would come to the physical library for books that were often unavailable. The Strengthening Human Resources for Health Activity is setting up a similar e-library for students at the Mulago Health Tutor’s College. Digital access to library materials means that students don’t have to share limited copies of resources and can spend more time studying independently. Schools can more efficiently use physical space, and teachers and school managers can devote more time to teaching the curricula and less to individual tutoring. Since 2012, SHRH has worked with Uganda’s government and public and private health training institutions to help develop the country’s future health workforce—by increasing enrolment and graduation of critical cadres through scholarships, revising national curricula standards, mentoring school administrators in leadership and management, and upgrading equipment and the learning environment in schools throughout the country. Through its USAID Human Resources for Health Strengthening Project, IntraHealth International has been working with the government of Uganda to increase national health sector staffing, strengthen pre-service and in-service training, and address performance and management problems, low retention, and skills gaps affecting the health workforce.